Novak N. M., Rabiee M., Tjoa A M. (2018). 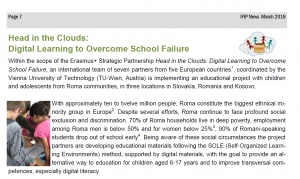 Head in the Clouds: An Initiative for Digital Learning among Roma Communities in Europe. 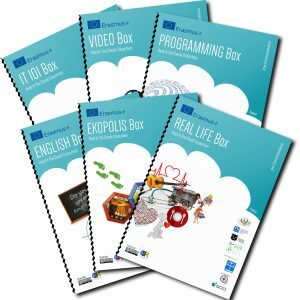 In: B. M. McLaren, R. Reilly, S. Zvacek, J. Uhomoibhi (eds): Proceedings of the 10th International Conference on Computer Supported Education (CSEDU 2018) – Volume 2, Funchal, Madeira – Portugal, March 15-17, 2018, SCITEPRESS, ISBN: 978-989-758-291-2, p.384-390, DOI: 10.5220/0006806803840390 . Pal‘ova D., Novak N. M., Weidinger V. (2017). Digital Learning as a tool to overcome school failure in minority groups. In: P. Biljanovic, M. Koricic, K. Skala, T. Galinac Grbac, M. Cicin-Sain, V. Sruk, S. Ribaric, S. Gros, B. Vrdolkak, M. Mauher, E. Tijan, F.Hormot (eds. ): 40th International Convention on Information and Communication Technology, Electronics and Microelectronics, MIPRO 2017, Opatija, Coratia, May 22 – 26, 2017. IEEE 2017, ISBN 978-953-233-090-8, p. 873 – 878. Each year, the Association for Educational Assessment organizes a conference for researchers, teachers, policy makers and anyone else interested in the field of educational measurement, which is attended by approximately 200 people. The 18th conference took place in Prague ( 9-11th November 2017) and its topic was Assessment Cultures in a Globalised World. Given the topic of the conference, we took the opportunity to present the Head in the Clouds project – the concept, goals and interim results. The presentation was attended by more than 30 people. 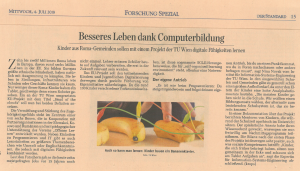 On July 4th 2018, Der Standard an Austrian national daily broadsheet newspaper, published an article, about the Head in the Clouds project, entitled “Besseres Leben dank Computerbildung”, following an Interview with Niina Novak (Vienna University of Technology). The online version of the article is available here. And the print version of the article can be downloaded by clicking on the picture below. 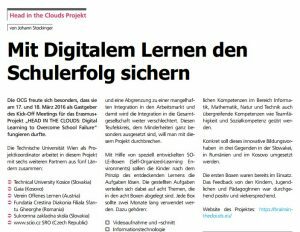 In March 2018 an article about “Head in the Clouds: Digital Learning to Overcome School Failure” was published in the International Federation for Information Processing’s (IFIP) newsletter. You can find the full issue of the IFIP News March 2018 here or directly take a look at our article on page 7 of the issue. We were also happy to contribute to the oead.news in autumn 2017. 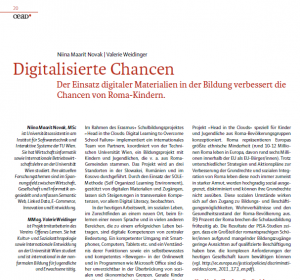 You can find the PDF-Version of the article “Digitalisierte Chancen” here or take a look at page 20 of the issue. The kick-off meeting took place in the collaboration with OCG. In their journal Johann Stockinger shared about this experience. You can still find the article here. Lulzim Bucolli was interviewed on radio and TV. SCIO published an article about the project on the magazine Perpetuum.